This introductory chapter presents the research domain, describes the aim and motivations of the research, and addresses its theoretical significance to cognitive science as well as some practical relevance to artificial intelligence and socially interactive technology. Furthermore, the research process is described, and the relationship between body, embodiment, and embodied cognition, is discussed, disentangling some misconceptions of embodiment, and describing how I view these concepts. First of all, there is the belief that, in talking about human cognitive activities, it is necessary to speak about mental representations and to posit a level of analysis wholly separate from the biological or neurological, on the one hand, and the sociological or cultural, on the other. 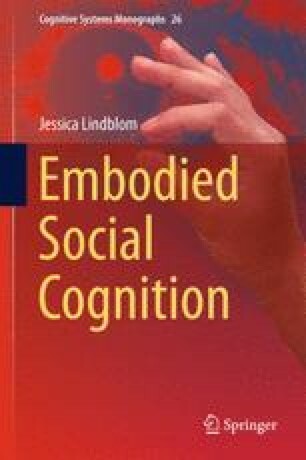 By using the term embodied we mean to highlight two points: first, that cognition depends upon the kinds of experiences that come from having a body with various sensorimotor capacities, and second, that these individual sensorimotor capacities themselves are embedded in a more surrounding biological, psychological and cultural context.